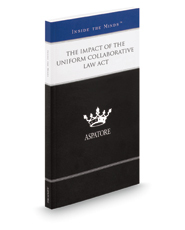 The Impact of the Uniform Collaborative Law Act provides an authoritative, insider's perspective on the role that collaborative law can play in the divorce process. Written by top partners and chairs from across the country, this book discusses the recent trends in the practice area, including the standardization that the UCLA will provide and the greater acceptance of a non-antagonistic legal process. These top lawyers consider key challenges, such as bringing in experts, working with difficult emotional issues, and cooperating with other members of the team. Additionally, they discuss when collaborative law is appropriate for settlement and when a litigation-based approach might work better. The different niches represented and the breadth of perspectives presented enable readers to get inside some of the great legal minds of today, as these experienced lawyers offer up their thoughts around the keys to success within this ever-changing field.